Claire Elam completes London Marathon! 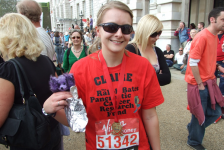 Claire Elam from Prestwich ran the London Marathon on behalf of our Fund! She completed the course in 4 hours 34 minutes and says she thoroughly enjoyed every minute of it.